What does the internet look like when we’re scattered across the solar system? Hi there! My name is Sands Fish. I’m a designer, artist, engineer, and educator. I’ve spent time as a fellow at Harvard, as a researcher-in-residence at IDEO, and as a student and researcher at the MIT Media Lab. This will be the first in a series of posts on designing the future of human life in space. I started thinking about the unique conditions of designing for space a year ago, when I was working on the Telemetron, the first electronic musical instrument for outer space (which Motherboard described as “post-earth”). My collaborator Nicole L’Huillier and I designed the instrument on Earth, but we could only speculate as to how it would behave in microgravity. We were able to test it on a flight chartered with Zero-G Corp, as part of an experimental flight with the MIT Space Exploration Initiative, and it was on that flight that I realized just how profound an environment space is for design. Many of the rules we take for granted under Earth’s gravity, as it turns out, simply do not apply, and this can be an extremely rich context for design. I have since begun working on a number of designs that engage with the unique conditions of living and operating in space. I will post about them here. Many of these projects are interested in the future of human life in space — how we will not only survive, but live out our daily lives, from the mundane to the poetic to the entirely new. The project I will describe below does not focus on human bodies in space as much of my work does, but about the unique challenges that come with communicating across space — specifically: interplanetary communication. I recently ran a workshop on this topic at MozFest, the London-based Mozilla conference. This is a gathering of people who love the internet and want to see it become healthier, more inclusive, and more open. It is also a broad gathering of people ready to engage with and envision the future. This was my first MozFest and I was excited to see articles like “10 Things to Do at MozFest for Sci-Fi and Fantasy Fans”, and “Mozilla Is Throwing A Science Fiction Convention in London”, which featured my session. My workshop gathered a full room of people excited to talk about how we might design future messaging apps for speaking to our friends and colleagues on Mars and anywhere else in the solar system. But while this sounds firmly within the realm of science-fiction, the tools we envisioned are grounded in a reality that is not that far away. The poster for the first Interplanetary Communications workshop. 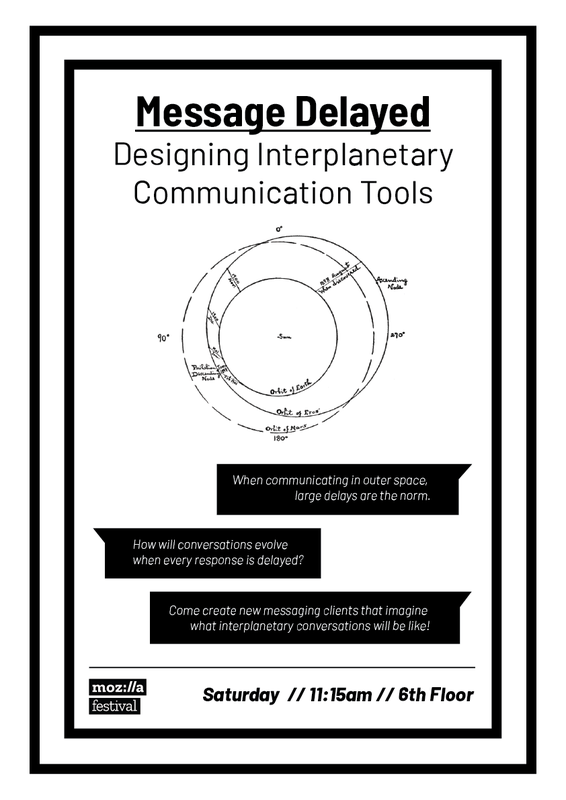 Designing for Interplanetary Messaging might not seem very exciting at first glance. We have tools like text messaging, email, etc. They’ll just take a long time to get there, right? Well, once you assume a constantly changing, very long delay in between everything that you say (for example, at its most distant, it takes 42 minutes for a round trip to Mars and back at the speed of light), it becomes clear that this will be a very different way to communicate. It is also an opportunity to think about how we define a conversation, and question the assumptions and affordances that we find in modern communication tools. Can we use this delay as a material in order to imagine how we’ll communicate in the future? This is one of the first ideas/predictions I overheard during the workshop and I was delighted — not because I like the idea of paying exorbitant prices to chat with my friends on Mars — but because this is a very legible future. Certain things change dramatically over time, but sometimes it is the pervasive and mundane details carried forward that make for a rich and useful contemplation on the future. In addition to being legible, it acts as a thread to pull on to uncover more interesting questions, e.g. what is the infrastructure of the solar system like and what does it prioritize? Who gets to talk to other planets? Will we have a broadly available link directly from the internet we know today to the interplanetary one? When you’re communicating at a distance, it’s a bit trickier to say “You up?” So how do we coordinate an impromptu conversation with such large delays? One team (@carolinesinders and @badboy_) came up with the concept of “anticipatory pings”, a function that would help time-shifted parties coordinate, facilitating when a good time to talk would be while using minimal bandwidth for efficiency, and providing some user interface queues for the next time both parties will be available. Lots of good adjacent ideas here for the importance of UI hints to help users grapple with an ever-changing interplanetary environment. Given the long wait for a response, ideally we’ll anticipate how the other side will respond and avoid asking unnecessary questions. One group’s solution to this was a “local AI” who can act as a stand-in for the remote friend, suggesting how they might respond before spending the bandwidth and time to send a thought to them. This would amount to a kind of pre-conversation to refine your communications. As with so many designs for the environment of outer space, this inspires ideas that would be just as interesting on our home planet. A simple solution to a problem that might arise in bandwidth-constrained or error-prone environments like space: Automatically generating transcripts for video messages and sending them ahead of the video data so that the message gets delivered and can be responded to even if the video fails to arrive or takes too long. If the message via transcript is ambiguous, the recipient can expect the video version to pick up on body language or tone queues. Sometimes, using a familiar concept helps us wrap our heads around a new one. One of my favorite ideas to emerge from this workshop, and I think quite a poetic one, is the concept of “latency seasons” — a conceptual framework for when two planets are close to each other or far away, which has implications for how long a conversation would take to play out. Are we in the season where communications are relatively quick between the two planets, or the one where they would take close to an hour? If we know the distance two planets are away from each other, we can roughly calculate how long it will take for a message to arrive, and how long a response might take to arrive if the message is responded to right away. An interplanetary progress bar is a UI element that displays this transit time, helping users to have a sense of where their messages are in transit. Another innovative idea that came up to address large latency times is to reduce the amount of confusion or misunderstanding that can happen in text communications. The cost is high for ambiguous communications when the round trip between two planets is so long. The proposed Paraphrase API would act in the same mode as a spell-checker, looking for confusing statements as you type, and suggesting things such as “This phrase is commonly misunderstood…”, offering you a chance to clarify your wording before spending the long amount of transit time only to find out they didn’t understand what you meant. Of course there were a million other little conversations going on throughout the workshop that would be a shame to exclude — some serious and some humorous. For instance, someone suggested that, given the complexity of scheduling around different night and day cycles across different planets, perhaps we will need a 3D Doodle poll (as if these weren’t a nightmare enough already), and another suggested that given bandwidth constraints, we might become a society that communicates entirely by animated gif. Jokes are always a fun part of a brainstorm like this, but they can also inspire the group to think about possibilities that wouldn’t have otherwise been explored. Comments about bandwidth limitations also led to discussions about how infrastructure might preference local processing, sending only what is necessary across the line, or how we might provide multiple choice answers with our questions for quick responses, saving in depth responses for later. Finally, someone suggested that, once interplanetary communication tools are created, new forms of discourse analysis might arise to grapple with these augmented conversations. This 90 minute workshop, with no participant preparation, shows just how rich futuring exercises can be when we focus on the possible futures of human expansion into the solar system. I’m excited to run more of these workshops, expand them to a full day or more, and render these ideas into interface mockups and prototypes for visual inspiration. Please get in touch (@sandsfish) if you would like to host future workshops. 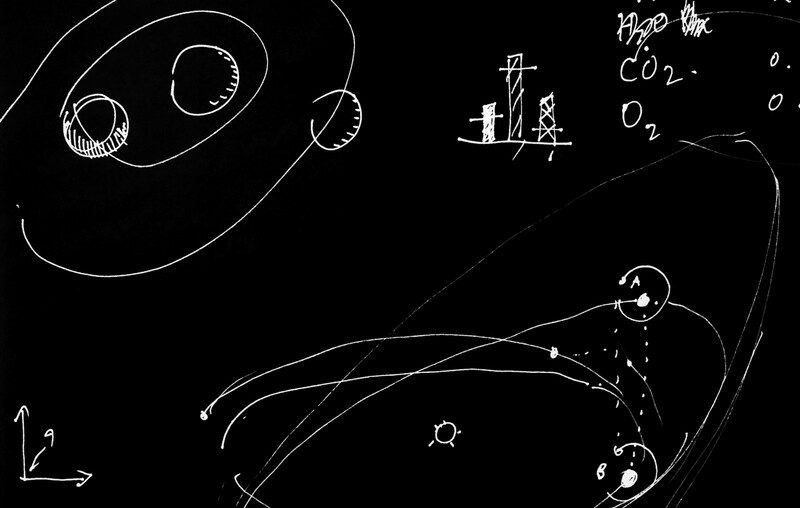 Follow me here as I write more about designing space futures!